Looking at Los Angeles | What Have Bangs Got to Do with It? All the talk about Michelle Obama’s new haircut inspires Catherine Wagely to look at bangs in art. Part two of Georgia Kotretsos’s interview with Chicago–based artist, writer, editor, professor, and curator Adelheid Mers. Michael Neault completes his blogging residency with a roundup of things to read. Artist Eleanor Antin will take over the @Art21 Twitter account to perform a special reading on Wednesday, January 30, from 3:00–4:00 p.m. EST. Georgia Kotretsos chats with Chicago–based artist, writer, editor, professor, and curator Adelheid Mers. Art21’s Associate Producer, Ian Forster, sheds a little light on our latest Exclusive. What’s the difference between the live and the digital viewing experience? Blogger-in-residence Michael Neault writes about a recent study by scientists in the UK. 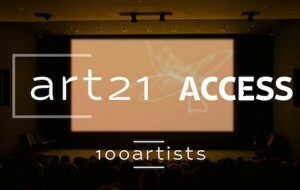 An introduction to the Art21 Translation Project by Art21 Director of Digital Media and Strategy, Jonathan Munar. With commencement on the horizon, Open Enrollment’s Sarah Merianos shares some of the important things she’s learned about arts management. How does an artist find relief from the pressures of the studio? Watch our latest NYCU film featuring artist Tommy Hartung. Blogger-in-Residence Michael Neault contemplates a question that artists and scientists have tried to answer: Can you reduce visual perception to a few fundamental elements? Columnist Safa Samiezade’-Yazd looks back on music videos of 2012 that spoke to the spirit of Arab uprisings. Open Enrollment’s Jenn Pascoe on how artists write about their own work and the value of the personal voice. While the NRA is quick to blame video games for violent behavior because they would much rather talk about something else besides banning assault weapons and ammunition (thank you, Governor Cuomo), I think that organizations like the International Game Developers Association could have a dramatic impact on the future of video games worldwide if the “creative” end of gaming wasn’t so consistently connected to killing people on a video screen. No Preservatives | Happy (Belated) Birthday, Tony Smith! You can help document the work of sculptor Tony Smith and get a limited-edition t-shirt, too! Columnist Richard McCoy has the details. Columnist Jacquelyn Gleisner Google chats with Nyssa Frank, owner of The Living Gallery, an alternative art space and community outreach venue in Brooklyn. In a new “Exclusive” video, artist Richard Serra describes the various tools and conceptual strategies he has used throughout his career when working with lead and steel. Marissa Perel speaks with Emily Roysdon about her recent performance at the Tate Modern, and her participation in MoMA’s first annual performance symposium. Columnist Danielle McCullough writes about the work of Los Angeles-based artist Heather Rasmussen and her ongoing interest in catastrophe. Antonius Wiriadjaja on helping two artists prepare for their upcoming shows in New York City. Contemporary artists and performers offer pathways into literature for the hard-to-inspire. Artists such as Glenn Ligon, Jenny Holzer, and even performances like the off-Broadway production of My Name is Asher Lev offer students ways to get inspired and involved with literature from different starting points. Artist and current MFA student Katherine Pulido shares her three resolutions for 2013. Blogger-in-residence Michael Neault writes about the science of eye tracking. What are our eyes doing when looking at a work of art? Nettrice Gaskins kicks off the week with a roundup of exhibition and events featuring Art21 artists.